Having an organized kitchen pantry can make your life much more efficient. Aren’t you tired of spending more time trying to find the ingredients for your meal than actually preparing it? Keeping your kitchen pantry organized can prove to be quite difficult when you have so much to store inside of it. Here’s three great ways to utilize your space and better organize your pantry. The inside of your cabinet door is a great place to incorporate shelves for smaller kitchen items such as condiments and seasonings. It’s not only easy and cheap to put in door storage, it also doesn’t require you to take up any more unnecessary space. Instead, you are simply utilizing the space that you already have in your pantry. A pantry can be incorporated into the cabinet space that you have already rather than building something separate. This saves space in your kitchen as well as the money you would spend on buying something separate to store your essentials. This gives you some extra money to possibly invest into the details of your cabinetry and make it look just as you want it to. 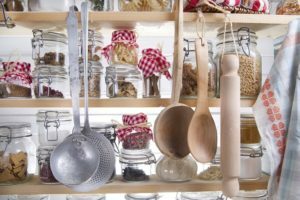 You can easily give your pantry a cleaner, more organized look just by using clear containers or even by using a consistent style of container. Rather than keeping items in their original packaging, putting them into containers will not only make your pantry look better, it will also make it easier to locate the things that you need. This tool will also provide more space in your pantry as some products can have bulky packaging. This entry was posted on Friday, January 12th, 2018 at 2:49 pm. Both comments and pings are currently closed.